Spoiler Alert: It didn't go well. But there's potential for dedicated individuals. Currently, I am sitting at my desk drinking coffee…and writing this article, of course. Five hours from now (more like ten, if I am being honest about my work habits), I will still be sitting at my desk as I continue to write away and continue to drink coffee. Today, since computers are omnipresent and ubiquitous, this is a reality for a great number of people. It is this fact, this sedentary lifestyle, that has led to the current global obesity epidemic. According to the Center for Disease Control, some 17% of children in the United States (about 12.7 million) are obese. For adults, the numbers are even more alarming. More than 34% of U.S. adults ( 78.6 million) are obese. That is precisely why a team from the University of Chicago created Cubii. 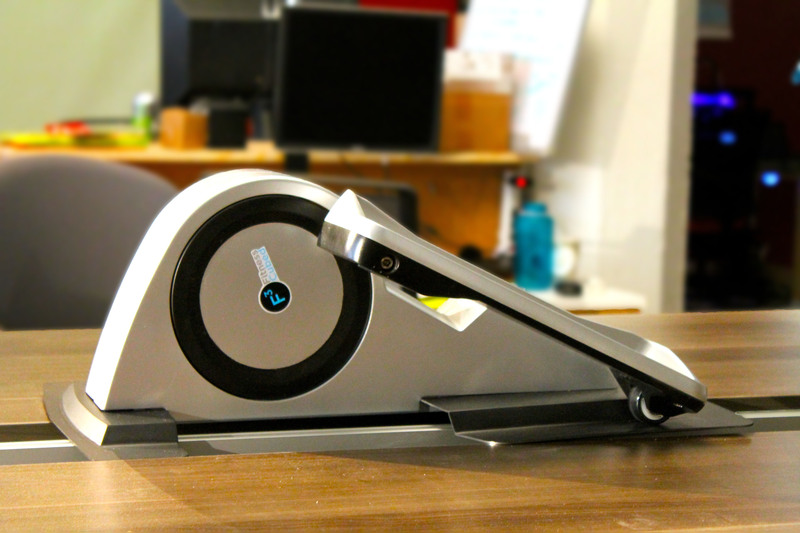 Cubii is an elliptical that fits under your desk. It made its way to Kickstarter in 2014 and raised some $293,000. Today, you can buy your own for $347. And it is more than just a machine. It comes with an app that lets you create groups, compete, and track how you measure up against others. But is this little exercise machine really effective? How does it stack up? The Cubii team sent one our way so that we could give it a trial. Here’s our thoughts in brief: It has potential, and it’s good for those with dedication, but there are a few issues. Read on for the details. To begin, most of our team is fairly health conscious, and since we are a media organization, the work that we do isn’t exactly what you’d call “physically challenging.” As a result, going to the gym is a regular thing for most of them (not me, I sit about and eat candy all day). Since the team is relatively into health and fitness, they hopped on the opportunity to give Cubii a try. For starters, setup is super simple—even for those who may not exactly be the best when it comes to tools and handy work. It takes about two minutes to get the device together and working (if that). It is also rather light. I am a fairly tiny person, but I could carry it about with ease. So if your day involves going from one meeting room to the next, you can transport Cubii with without a problem. The design is comfortable and allows you to sit naturally at your desk. In fact, you can pedal away without any of your coworkers even noticing. Or at least, I could. My taller coworkers proceeded to smash their legs against their desk as they furiously tried to pedal. Part of the problem is, of course, how high your desk is and how your laptop is situated. Alex had no problem with Cubii, as his laptop is raised, and so he could sit farther away from his desk. Clearly, we need taller desks…or shorter employees. But assuming that it does fit your work setup, like all workout regimes, you need to be committed. Although sitting at your desk and working out while you work sounds convenient, it is a little hard to focus on your work while pedaling. And let’s be honest, most people don’t want to work out at work. The team had a lot of initial enthusiasm, but no one stuck with it. So it may just be another piece of workout equipment that collects dust. It’s up to you. If you are the dedicated sort, then Cubii works wonderfully. The app features are engaging and easy to use. You enter in your height, weight, and other relevant health info. Then, you can track how many miles you’ve gone, how to are doing compared to those that you know, and whether you are meeting your goals. There are also resistance features. However, there is an issue with rolling. “The trick is, you can’t have a chair with wheels,” Alex notes. You see, we all have rather large computer chairs with wheels, and to quote Alex again, “that totally messes everything up.” Cubii came with little stoppers that are meant to prevent the chair from rolling about, but that also causes issues. Sam articulated the problem: “I basically can’t get out of my desk all day, which is a good motivation for working, I guess.” Still, this problem is easily solved if you put some effort into finding a chair sans wheels. To sum again: The problems are not insurmountable. And for those who are willing to dedicate themselves to it, it’s a handy way to stay active, track your progress, and have a bit of fun with your coworkers are friends.